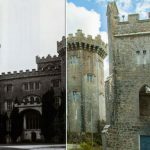 Our Before and After Offaly section depicts various places around Offaly via archive images and newly created contemporary images. Birr – A selection of archive images combined with their contemporary equivalent from the Birr area including – Cumberland Square, Main Street, Birr Castle, John’s Mall and St. Brendan’s Church. Clara – A visual past and present of a selection of locations from around Clara – including Main Street, The Square, Fair Green, St. Bridget’s Church, Clara Train Station and more. Tullamore – A Century On – Using archive images – members of the Tullamore Camera Club recreated a selection of photographs including – The Courthouse, Tullamore Train Station, O’ Connor Square, Clara Bridge, Charleville Castle, Whitehall Bridge and more. We wish to thank the Members of Tullamore Camera Club for these images and look forward to working together in the future.